A chronic alcoholic brought unconscious. 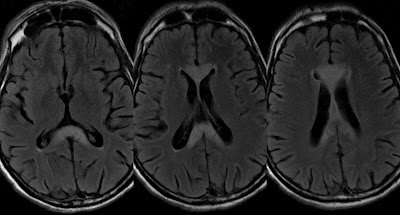 On admission MRI axial FLAIR shows T2 hyper intensity confined to corpus callosum with restricted diffusion on Dw images. 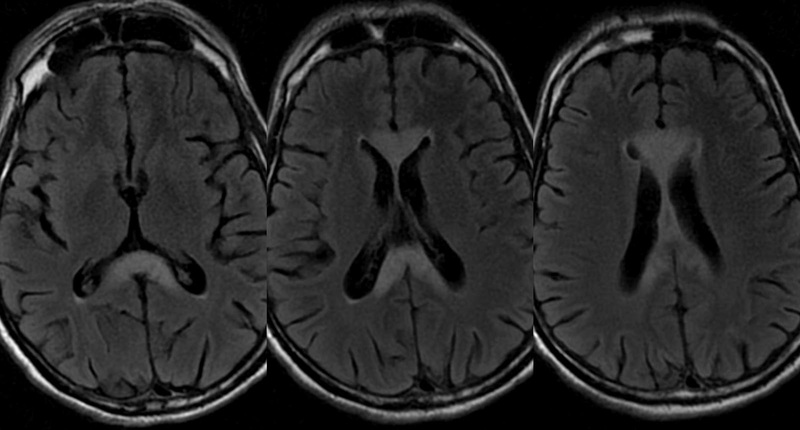 A rare toxic disease that results in progressive demyelination and necrosis of the corpus callosum. Mostly seen in chronic alcoholics but occasionally seen in non alcoholics. Believed to be mainly due to deficiency of Vitamin B complex as many improve with Vit B supplementation but some may not. At first, MB was thought to be particular to individuals living in the central region of Italy and consuming large amounts of inexpensive Chianti red wine. It is now known that MB occurs worldwide with all other alcoholic beverages too. Most males, between 40 and 60 years of age with history of chronic alcoholism and malnutrition. Diagnosis is made on the basis of clinical findings in combination with imaging. Acute MB patients present with mental confusion, disorientation, neurocognitive deficits, and seizures. Most of them go into coma and eventually die. Acute MB may be difficult to distinguish from Wernicke encephalopathy and may occur together. Patients with Wernicke encephalopathy have ataxia, ophthalmoplegia, nystagmus, and confusion. Subacute form of MB is characterized by dementia, disarthria, and muscle hypertonia—may survive for years. Chronic form of MB is characterized by a chronic dementia and now differentials includes Alzheimer disease, multi-infarct dementia, and Pick disease. On MRI, MB show high T2 and FLAIR signal intensity, typically affects the body of the corpus callosum, followed by the genu, and finally the splenium. The entire corpus callosum may be also involved. May extend to adjacent white matter tracts such as the anterior and posterior commisures and the cortico-spinal tracts. The corpus callosum degenerates and splits into three layers - “layered necrosis”. The reason of predilection for corpus callosum is not known. 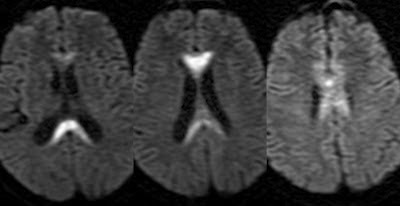 The lesions are difficult to visualize on CT.
On MR spectroscopy mildly increased choline level (probably secondary to acute demyelination), low N-acetyl aspartate (probably secondary to neuronal damage), and the presence of lactate. Other lesions showing restricted diffusion in corpus callosum include infarctions, shearing injuries, demyelination and Encephalitis. Differentiating acute MB from Wernicke encephalopathy on imaging is not difficult; WE shows abnormal signal intensity and contrast enhancement in the mamillary bodies, periaqueductal region and the walls of the third ventricle.